The Japanese artist Majima Ryoichi (b. 1947) studied art in California. 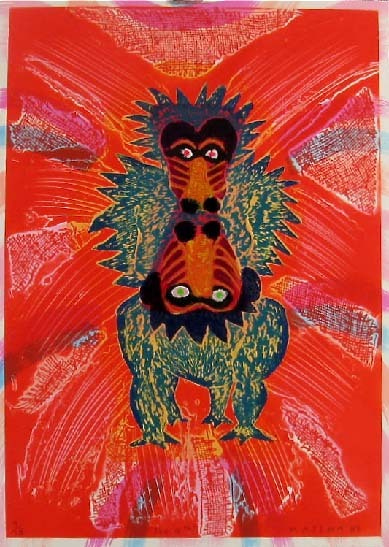 His "Neo-pop" prints are imaginative and irreverent examples of "East meets West," rendered in a vivid palette. 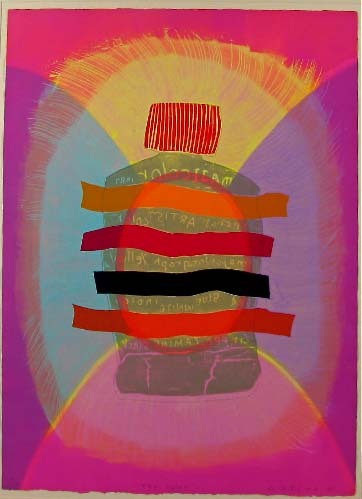 The collagraph entitled The Color, one of the three prints shown, depicts a paint tube; the riddle-like backwards lettering of its label-text includes the brand name "Majicolor," a playful reference to the artist's name. Majima aims to energize and nourish viewers and to provide "food for thought." 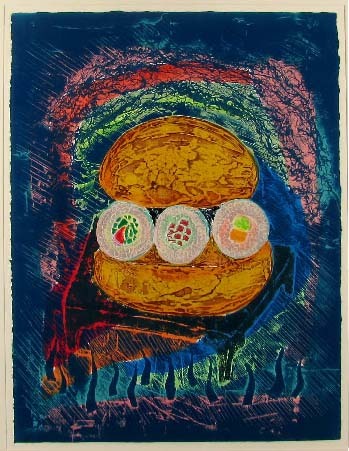 In his depiction of a "sushi burger" the artist criticizes foods and 24-hour convenience stores (konbini). He considers such fast foods and stores to be models of a westernized consumer culture and society that has destroyed traditional neighborly relationships between sellers and customers. Majima is famous for having created a "Majimart" installation at a Tokyo gallery and for his humorous plastic sculptures of foods. His empathy for animals, which he stresses have emotions, is sensed in his whimsical depiction of a Chinese dragon.